Plywood is the best to use as a base for cutting, you can also use some 2x1 timber around the outside edge to make a 90° angle or a box to fit your material into. This will help secure what you intend to cut. This can be used for all applications, i.e. 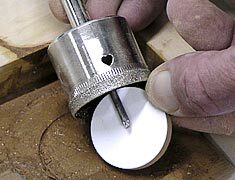 when using your: drill press, power drill or cordless drill. The base can be fixed or locked down to secure it from moving from side to side. This is a very safe way of cutting tiles and glass. This is the Ezi-Cut meathod! 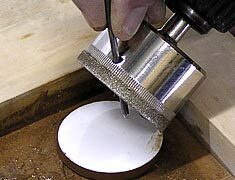 Using external or marine plywood is best, pre-drill your timber using a metal hole saw or a Jigsaw to suit the Diamond Coated Hole Saw™ product you need to use. It's best to cut the hole in your template slightly larger to prevent the Diamond Coated Hole Saw™ product Jaming we recommend this be 1 to 1.5mm. Or you can use c-cut wall drilling guide (CCTWDG and CCTBWDG) as your template. Then simply place your template over the area you wish to cut. Using: C-cut water containment rings, Blu-Tack or Putty is best, this can be used on most surfaces. Retaining the lubricant will help increase the life of the Diamond Coated Hole Saw™ products. Next build your dam by pressing your water ring or using blu-tack or putty. Its best to use a permanent marker when using water. Markout the area you wish to cut place your Blu-Tack around the area you want to cut, then you are ready to proceed with the cutting. When drilling vertically, wall tiles that are fixed take note of the thickness, you can mark the saw or drill bit. Using electrical tape as a depth gauge, this can help prevent you cutting into concrete. Use a spray bottle to help assist in keeping the area wet! Most other drill bits require high speed, some with a hammer action. Speeds can vary as some materials are harder than others. The rule of thumb is, the harder the material and the larger the saw or drill bit that you wish to use, the slower the better, plus a lot of water. For the smaller hole saw the same applies. However, if you are cutting a more porous surface you can increase the speed, but keep in mind use plenty of water is required to keep the hole saw cool. Use a spray bottle to help assist in keeping the area wet! Excess speed/pressure will reduce the life of any cutting tool. When drilling fixed floor tiles try to gauge the depth. Take your time! Floor tiles can be very hard. Keep the Diamond Coated Hole Saw™ well lubricated. Use low slow speed and pressure, let the Diamond Coated Hole Saw™ products do the work, as you come closer to cutting through the materail, increase speed this will give a cleaner cut on the exit. After cutting any material always remove the waste piece. If you don’t do this you will cause a lot more friction to the saw or drill bit, you will also find it very difficult to cut a second hole. To remove the waste piece remove the hole saw from your drill,using a 3” nail or a very fine screw driver, push this through the centre or through side holes downwards. The Diamond Coated Hole Saw™ Product Range Product range is from DCHS5mm to DCHS128mm. We also have a very good mixed product range. Be sure to use our Product codes when ordering DCHS____. The Diamond Coated Hole Saw™ product range suit most of what's needed to complete any new or newly renovated bathroom. (DCHS) Diamond Coated Hole Saw™ Products. DCHS6,8 & 10mm are suited for most hand & shower rails, including toilet pans and cisterns. DCHS124 to 128mm these and the above can also be used for cutting through compressed fibro sheeting and plaster board for soil pipes. The Diamond Coated Hole Saw™ products cut faster and cleaner than any other products available. Saving you time and money but most importantly giving you the finest cut.